Masahiro Sakurai of Smash Brothers fame is wary of innovation for innovation's sake. Little has been revealed about the upcoming Super Smash Brothers 4 game, beyond a few snippets. However Masahiro Sakurai, the man behind Smash Brothers, has gone on the record as saying he doesn't feel the game needs to change much, and isn't willing to introduce non-Nintendo characters just for the sake of it. "The game system itself is complete, so we don't want to make it 3D or introduce complicated controls just for the sake of it," Sakurai said. He acknowledges the need for some changes to incorporate new Wii U controller options, but doesn't want to invest heavily in innovation if it brings nothing useful to the game. He says he is "thinking of ways we can introduce a slightly different, fun experience," but significant changes to the controller scheme doesn't appear to be among them. Neither is introducing non-Nintendo characters to the brawler. "I think Snake and Sonic joining were fantastic. It made many fans happy, and it broadened the Smash Brothersarena," Sakurai admitted, but he swiftly went on to say that putting more non-Nintendo characters in would "lose the focus of the game." 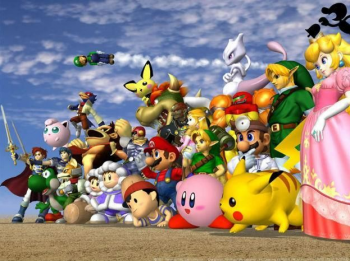 Sakurai would prefer to narrow down, rather than inflate, the character list. Anyone out there who hoped Tekken characters might be among the playable character list should brace themselves for disappointment. Super Smash Brothers 4 is currently scheduled for a 2013 release on Wii U and 3DS.